Xiaomi recently introduced its new smartphone Poco F1 in the Indian Market. And along with that, they also introduced a new UI called MIUI for Poco and a new launcher named Poco launcher. The new Poco launcher by Team Poco created a huge buzz all over. Xiaomi announced that the launcher will be available for other Xiaomi smartphone as soon the phone launched but it’ll come for all a bit later. After a short break, they finally released a beta version of Poco Launcher in the Google Play Store. We installed the new launcher on our Android devices and here’s what we think about the Poco launcher and should you Install or Not. The new Poco launcher comes with a simplified and clean UI. It stores all the apps under App Drawer and only ally few on the main Home Screen. The clean UI also helps us to save the time we spent on the unnecessary apps floating on the main home screen. If you like all apps on the home, you can set them from the settings. The apps on the Home Screen or in the App Drawer offers small shortcuts. Those shortcuts can be used by a short firm press, a pop option will occur and users can choose it. Like the Clock app offers to set an alarm while the Message app offers to send a text and more. The UI offers a search bar at the bottom which gives relevant app recommendations as soon we type any letter of the name. It not only searches for the apps but also gives an option to search on the web also. The App Drawer has all the apps in categories listed automatically. For us, it listed apps under tabs like All, Communication, Entertainment, Photography, Tools, Games, Lifestyle, and Personalization. All the apps are accurately curated under those tabs and no further manual customization was needed. But if you wish you can also curate them as per your choice. 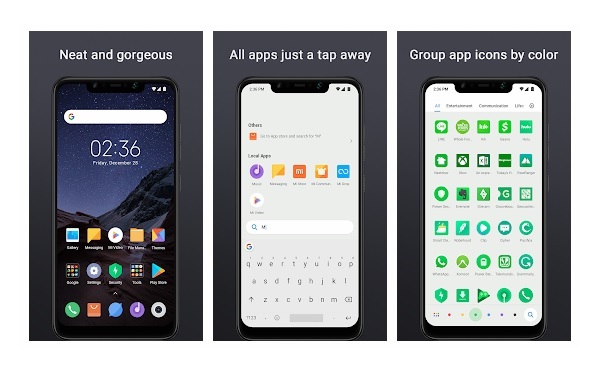 The Poco launcher offers the users to create and manage app groups. Not only this, users can also use third-party icons pack to make their UI more elegant. You can also group icons with different colors so you easily find them in the App Drawer or in the Home Screen. What do we like most about the new Poco Launcher? Xiaomi and Team Poco certainly created a beautiful launcher with minimal UI. Some features we liked the most in that are the categorized apps under the App Drawer and the customized search option. These two features are one of the best we’ve seen on any Launcher. What things did we miss on the Poco Launcher? We’ve already seen minimal launchers like Evie and Nova. What we miss on the new Poco Launcher are the limited customization and system animations. We thought if there were more options to customize the Home Screen or App Drawer like choosing the grid size, the size of icons or choosing between several icons. Note: The privacy option was also missing, maybe because of the beta version. We hope that the final version would have it. The Poco Launcher is unique in its own way. It does not have any additional animations which make it faster than others. But it does offer good features like a search bar and grouping option. It does also miss the customizations features. If you want a simple launcher with limited features. You can definitely try the new Poco Launcher. You can find the beta version of the new Poco Launcher on the Google Play Store. If by any chance you’re not able to download them from there, you can also go for the third party option such as APK Mirror and APK Pure. You can also download the Poco Launcher from the links given below. Previous articleWhat’s new with the redesigned Google Wear OS?